Inside the White House, there still appeared to be confusion about the timing and extent of the planned tariffs, which would hit allies like Canada and Mexico hard. Trump announced that US will impose tariffs of 25 percent on steel and 10 percent on aluminum imports. 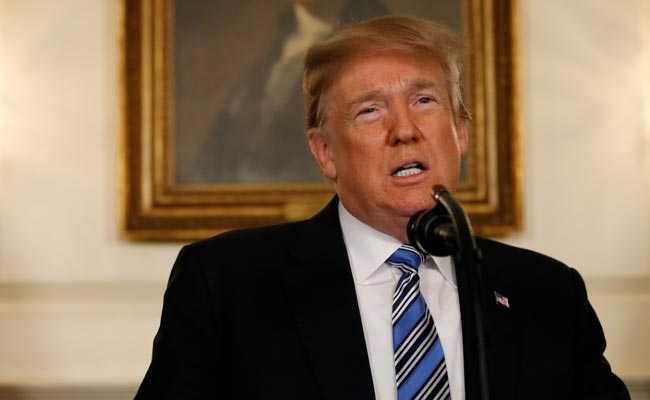 Washington, United States: US President Donald Trump faced growing pressure on Monday from political and diplomatic allies as well as US companies urging him to pull back from proposed steel and aluminum tariffs, although he said he would stick to his guns. Efforts by Trump and US trade negotiators to link the NAFTA trade pact talks to the duties received short shrift from Ottawa and Mexico City. Leading Republicans turned up the pressure on Trump, with House of Representatives Speaker Paul Ryan leading the charge. Ryan's home state of Wisconsin would be hit by proposed European counter-measures on Harley-Davidson Inc motorbikes. Representative Kevin Brady, another top House Republican, called on Trump not to hit America's closest allies. The planned tariffs have roiled world stock markets as investors worried about the prospect of an escalating trade war that would derail global economic growth. Stocks across the globe rose on Monday, however, after four days in decline as investors saw the tariff threats as a US negotiating tactic and not a done deal and as pressure grew on Trump to back off. "We're not backing down," Trump said during a White House meeting with Israeli Prime Minister Benjamin Netanyahu. "I don't think you're going to have a trade war," he added, without elaborating. Canadian Prime Minister Justin Trudeau called Trump on Monday to tell him the tariffs would be an impediment to talks on updating NAFTA, a Canadian government official said. Canada is the single largest supplier of steel and aluminum to the United States. In the call, Trudeau "forcefully defended" Canadian workers and industries, said the official, describing the conversation as constructive. Earlier comments from Trump had stoked talk of a global trade war as he described them as easy to win and issued a threat to German carmakers. One of those, BMW, runs a plant in the United States that is the largest single autos exporter in the country and has created thousands of jobs. Most responses to Trump's proposed tariffs have been targeted. The European Union said it would hit Harleys, bourbon and jeans, iconic American products. It did not threaten to ramp up the issue. China has been largely mum, urging caution, and both Canada and Mexico have stressed the targeted nature of any response. STRESSES INSIDE THE WHITE HOUSE? Trump was expected to finalize the planned tariffs later in the week, although some observers familiar with the process said it could occur next week. The initial announcement by Trump last week came as a surprise. The United States, Mexico and Canada have been holding talks over changes to the North American Free Trade Agreement, a pact that Trump has threatened to abandon. Six months of tense talks have produced little in the way of progress and a move by Washington to link the steel and aluminum tariffs to progress on NAFTA was rebuffed by Canada and Mexico. US Trade Representative Robert Lighthizer also attempted to drive a wedge between Canada and Mexico when he suggested the United States would be willing to hold bilateral, rather than trilateral talks. The two countries again stood firm. In Washington, aides scrambled to meet Trump's demand for the paperwork to be completed for a formal announcement. The exact timing was unclear as the tariff documentation had to be drafted and go through a variety of reviews, a process that takes days, an administration official said. There was always a chance that Trump "could amend his initial announcement" to take account of the concerns expressed about it, said a source familiar with the internal debate at the White House. Trump has frequently talked tough on trade, although his actions have not always matched his words. On his first day in office in January 2017, he withdrew from the 14-nation Trans Pacific Partnership agreement, a deal that was dead on arrival in the US Congress in any case. He has frequently tweeted and said that he would pull out of NAFTA, which he has called a jobs killer. But a year after taking office, the 1994 deal remains intact. Trump has approved a series of small-scale trade actions, of which the steel and aluminum duties would be a part. Taken together with actions on washing machines and solar panels, the proposed move accounts for just 4.1 percent of US imports. In terms of global trade, they are just 0.6 percent, investment bank Morgan Stanley said in a report. The head of the World Trade Organization warned of a real risk of triggering an escalation of global trade barriers and a deep recession, even as financial markets and many economists started to discount the risk of a global crisis. "We must make every effort to avoid the fall of the first dominoes. There is still time," WTO Director General Roberto Azevedo told the heads of WTO delegations at a closed-door meeting in Geneva.